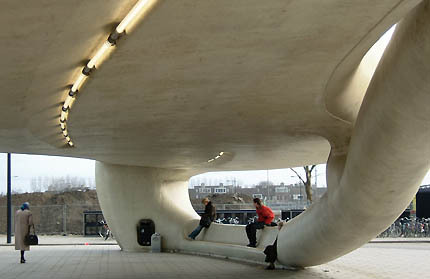 This blob bus stop won an ar+d prize from the Architectural Review, and is the world's biggest structure built entirely from synthetic materials: factory-cut polystyrene foam with a polyester skin. 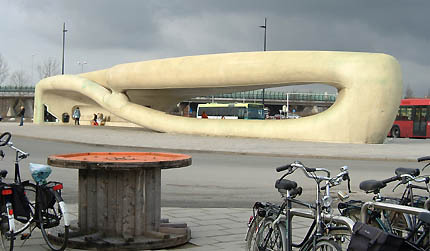 It is the terminus of several bus routes in Hoofddorp, forming an oval roundabout in front of the edge-of-town hospital. The length of the structure gives it a grace and elegance as sculpture, somewhat spoilt already by a green color emerging from the polyester, especially around the most prominent join. 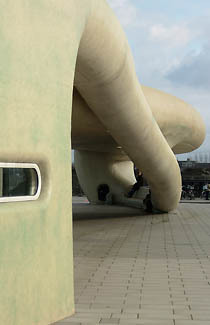 The ar+d jury "was impressed by the spatial and technical élan and ingenuity of the building... Almost all blobs create a zone of dead space round them. But here the dead area already exists." While this is true, it is rather a negative way of looking at the context, and does not address what it is like to come out of the hospital and wait for a bus. The interior is sculpturally exciting, but not welcoming. Here the long, low profile that gives the grace to the outside elevation creates emptiness and exposure. 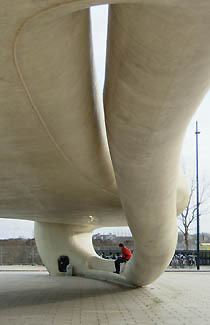 The molded contours in the ceiling are already accumulating grime, and the youths sitting on the top of the rib with their feet on the seats are doing so not just because it's a cooler place to sit and text, but because backward-sloping molded seat also accumulates grime that makes it unappealing to sit on. NIO did their homework in testing their unconventional materials against active vandalism from knives, cigarettes, graffiti and so on, but may not have sufficiently anticipated the effect of less willful human wear and tear. Although the building is sculpturally well placed, and protected against vandalism, it does not feel empathetic towards the more benign hospital visitors it is there to serve. Hoofddorp is a small but fast-growing town near Sciphol Airport, one stop on the train towards Den Haag (or from Amsterdam, one stop beyond Sciphol on the stopping train towards Den Haag). From Hoofddorp train station, you can reach the bus station by bus in about 20 minutes: take a bus marked "Spaarne Ziekenhuis", which is the hospital the bus station serves and is the end of the route. Routes 52 and 196 both work; you can also take route 196 directly from Sciphol Airport. Maps and other directions, but only in Dutch, are at the hospital's web site.